PULL OFF A BIG SCORE WITH THE CREW OF THE SERENITY. 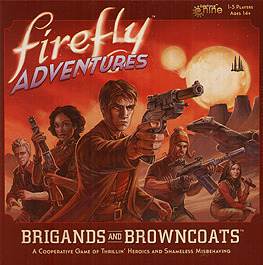 Firefly Adventures is a cooperative game for 1 to 5 players, working together to thwart local goons and get the job done. Will you use your wits to manoeuvre your way to success? Or will your trusty sidearm open the doors standing in your way? Crew members can try to keep it quiet or go in like Big Damn Heroes. Double-sided Crew Cards let you choose how you're Acting. Each side of the Card shows different Actions you can take. Includes both a Casual and Heroic miniature for each Crew member! Equip your Crew with a variety of Guns, Gadgets, and Gear! Create a variety of scenarios with pre-built, three-dimensional buildings and double-sided map tiles!